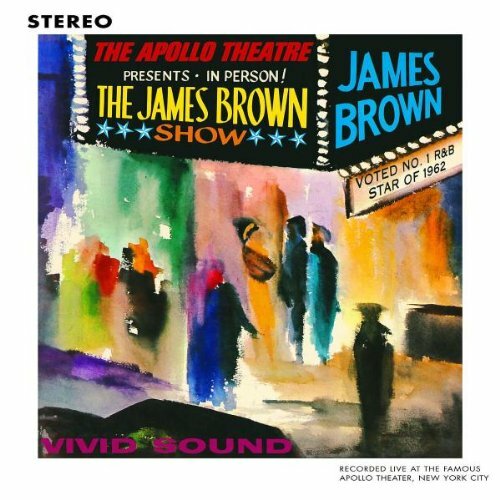 One of the best live albums in music history, James Brown – Live at the Apollo was recorded october 24 in 1962. My favourite moment: The whole horn infused “Think” that borrows heavily from jazz legend Charlie Parker in the way Brown scats over the band with the crowd participating enthusiastically. Not remotely like the studio versions and terribly good! 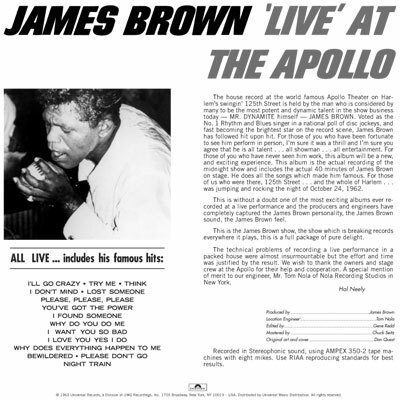 Before the release of the classical and hugely influential ‘Live At The Apollo’ in 1962, James Brown was something of an unknown quantity outside of the R&B charts of the US south. Staying on the pop charts for 14 months, and peaking at #2, it’s a demonstration of Brown’s self-belief that he (himself!) had financed and released the recording when his label saw no sense in releasing a live album that featured no new material. Brown went on to record several more albums at the Apollo over the course of his career, including 1968’s Live at the Apollo, Vol. II (King), 1971’s Revolution of the Mind: Recorded Live at the Apollo, Vol. III(Polydor) and Live at the Apollo 1995 (Scotti Bros.). “An astonishing record of James and the Flames tearing the roof off the sucker at the mecca of R&B theatres, New York’s Apollo. When King Records owner Syd Nathan refused to fund the recording, thinking it commercial folly, Brown single-mindedly proceeded anyway, paying for it out of his own pocket. He had been out on the road night after night for a while, and he knew that the magic that was part and parcel of a James Brown show was something no record had ever caught. Big and deserved praise indeed!